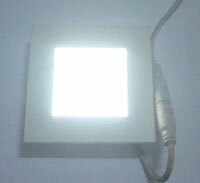 We see lot of LED Panel Lights flooding cool light in commercial buildings, offices, banks etc. I love LED Panel lights because these are high efficient and economic lights. They also not cause any eye strain. Unlike LED Bulbs, the efficiency of LED panel lights is very high and gives the Lumen, K and Power as per the specifications provided because of the use of LED Driver with constant current output .The use of LED driver increases efficiency because the input AC fluctuations will not reflects in the output. So the LED Driver gives constant voltage and current for the LEDs inside the Panel. The result is uniform light throughout the life period of the Lamp as high as 1 lack hours. The only problem in the LED Panel lights is that the Driver may fail if there is a high voltage surge in AC lines that may occur during unexpected lightning or other reasons. But we can easily replace the Driver because it is externally connected. The cost of the Driver is between Rs.50 and Rs.100. Let us analyse one LED Panel light to see its interior and efficiency.